Simple food sublime | Izzy have you eaten? I was shopping late one afternoon at Wholefoods in Yorkville, Izzy. The rain was coming down, and I wanted to find something comforting but light to cook for dinner. It had to be quick. It was already a scrambled day. The people coming to look at the house at 2.30 came late. More were coming right at dinner time. Cruising the fresh produce aisles, I found lots of heirloom root vegetables and a variety of tomatoes. The weather feels like a long way off from summer, but somewhere closeby it seems the tomatoes are coming into their own. 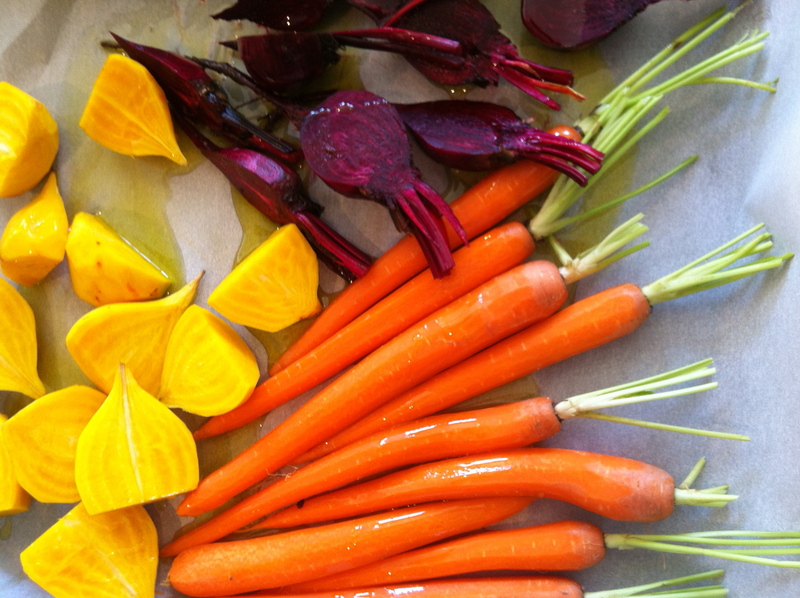 So I put the beautiful root vegetables on some parchment paper and drizzled them with oil, and popped them in the oven. The tomatoes: yellow, purple, orange and red were roughly chopped and tossed with fresh mint and more lovely olive oil and a squeeze of lemon. 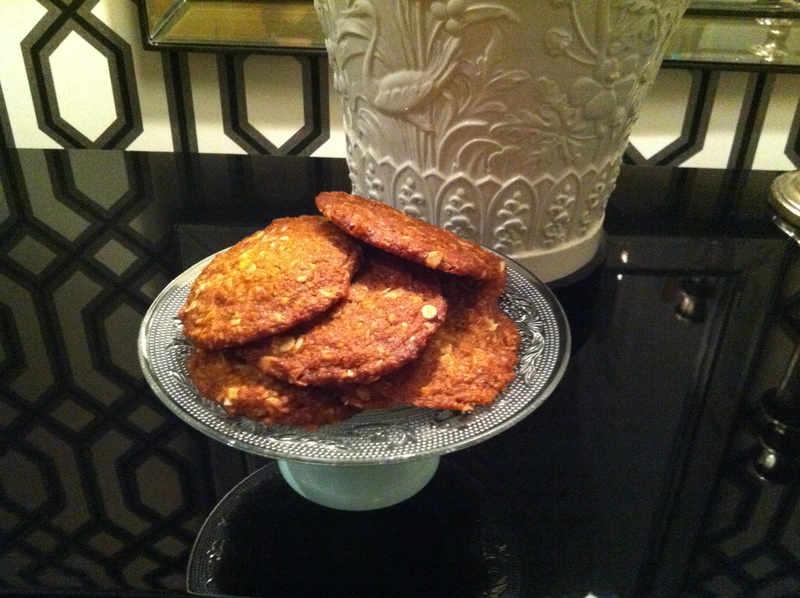 As I waited for the medley of vegetables in the oven to cook, I thought it was time to put together a batch of Anzacs. Always good for a late night homework snack for you-know who ( and for the rest of us, who am I kidding!). I will never forget when you baked us some. We were getting off a long couple of flights to come be with you in Melbourne. You had travelled across town from campus, let yourself into the Eildon Road house, shopped and cooked and had everything so lovely for when we arrived. The pile of neat Anzac biscuits was perfect. It was the best welcome home ever!! You should have that recipe to keep for sure. Anzacs are a wonderful treat. You used to be able to get them more easily at the local Aussie bakeries, but nowadays, the commercial variety is no comparison to the ones baked at home. Thank goodness for friends like Lyn and Giselle who continue to keep such wonderful traditions of baking old fashioned favourites like these. This here is a combination of their recipes, so credit goes to my two dear expert bakers for inspiring me with their failsafe and totally delicious recipes. Just look at this picture of the cookie dough, Izz: if I ever dare make them with you all around, it is a race to get them in the oven before you and your sister and your dad eat half the dough! The treacly taste of the golden syrup combined with the coconut and oat meal are pretty irresistible, cooked or raw. Just wanted to remind you of how the simple pleasures of simple cooking can be so rewarding. But I think you are finding that out yourself! Happy cooking, Miss! Mix first 4-6 ingredients together in bowl. Melt butter + syrup over low heat in saucepan. Dissolve bi carb in boiling water. Drop spoonfuls on to greased tray. Bake for 15-17 min at 150C ( watch them carefully) , until barely golden for a chewy softer texture, but a deeper gold for it to crisp up. This entry was posted in GROUP C, Uncategorized and tagged Anzac Biscuits, Root Vegetables, Tomatoes by tgb9593. Bookmark the permalink. Hi Tina – lovely post. 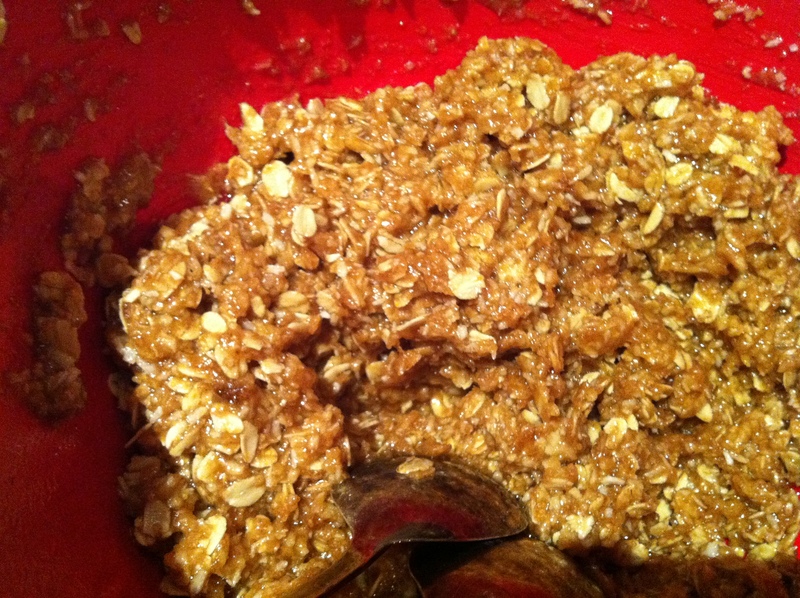 I just made 2 batches of Anzac biscuits in the last week – great for school lunchboxes ! How are those goegeous children of yours? We are counting down to departure-June 15. Not much cooking going on we are so busy! Pingback: More veg please! (Clauliflower Peretel) | izzy have you eaten ? Pingback: Biscotti: Just A Little Nibble! | Izzy have you eaten? Pingback: Australia Day From Afar : Parmesan Biscuits for Nibbling. | Izzy have you eaten?